Distinctive features: Tree; Flat needles.  Eastern Hemlock (Tsuga canadensis) - very similar; needels shorter, more spread apart.  Yew (Taxus canadensis) - a sprawling shrub, and its needles are green underneath. Edible: The needles make a nice bush tea. Photographs: 169 photographs available, of which 5 are featured on this page. SCROLL DOWN FOR PHOTOGRAPHS. 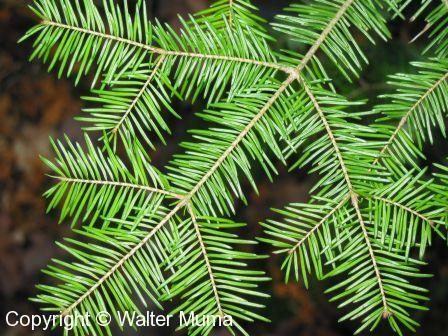 Balsam Fir needles resemble those of Eastern Hemlock (Tsuga canadensis), except they are longer. They are also attached to the twig with a tiny disk. Eastern Hemlock needles are attached with a tiny stem. The needles have a white stripe underneath (not shown). A delicious tea can be made from Balsam Fir needles. Be sure to add the needles to the hot water after it has been removed from the source of heat. If you boil the needles with the water, the tea will taste of turpentine! 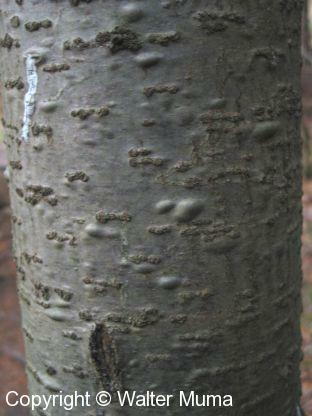 Balsam Fir bark and trunks often have numerous small blisters filled with sap. The picture on the left shows these really well. 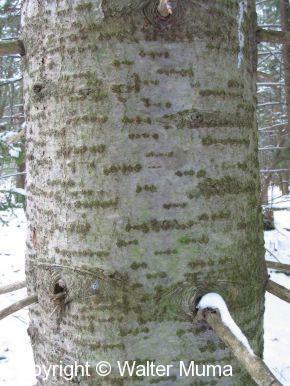 Here is a picture showing the overall shape and form of the Balsam Fir. Balsam Fir sap exhibits a rather unusual phenomenon. When fresh liquid sap is dabbed onto the end of a twig and placed on the surface of the water, the sap acts as a "motor", propelling the twig away. Click here to view a movie of this actually happening (741KB, MPEG format).